[00:20:10] <seb_kuzminsky> what param do you want to set? [00:21:40] <kwallace> That seems clunky but I guess one does what one needs to do. Thank you. [00:44:46] <kwallace2> seb_kuzminsky, (back from dinner) yeah I recall that too. I suppose it would not be hard to use the existing component to make a new one with only pins. Either way, it's only software, how hard could it be? [17:29:01] <pcw_home> cradek: you must use home to index, have you ever seen any thump on index issues? [18:00:29] <cradek> I hope something hasn't rotted. My mill hasn't been updated forever. I have no idea what's running on it. [18:02:07] <cradek> pcw_home: is the setup having trouble using any of the deriv inputs? [18:10:48] <cradek> yeah the comment says "but velocity is usually very small during index search"
[18:11:04] <cradek> does he have any FF0? [18:16:57] <pcw_home> hmmm is there a max/min component? [18:25:19] <cradek> I am absolutely sure my mill no longer thumps. it was extremely violent before I fixed it. [18:26:05] <cradek> they're not using software encoders are they? [20:33:36] <kwallace> I keep losing my autosave.halscope. Is there a way to load a halscope saved config when using "loadusr halscope"? Unless I'm missing something, it doesn't look like halscope takes any arguments. [20:41:32] <kwallace> My problem is that I use "loadusr halscope" in a hal file to invoke halscope. Another issue is that halscope looks for autosave.conf and loads it, which is fine except my application doesn't close halscope, it does an "unloadusr all" in my .hal file. This clobbers the autosave.conf and the next run doesn't run halscope with the saved config. [20:46:21] <kwallace> It would be nice to be able invoke halscope with the desired config file name. Another option might be to copy my conf file over autosave.conf before I start my application, but I'd like to avoid that. [20:52:11] <kwallace> But I would not normally touch halscope. I just type in a couple values into a ui.py display, halscope shows if the signals are correct, then I close the ui.py and it takes halscope with it when it leaves. The config is okay if I close with the X box in halscope before closing the ui, but that's not intuitive. [21:02:47] <kwallace> cradek: Well, I suppose I could look at the halscope source and see if anything comes to mind. [21:45:35] <kwallace> I am playing with a transistor ignition and need a pulse source to trigger it. [22:14:43] <CaptHindsight> what is the reference clock? [22:15:13] <kwallace> CaptHindsite: I need to learn more about piezo injectors. I'd like to fit an injector to my garden tractor but I'd like to not need a high pressure pump to feed the injector. [22:16:12] <kwallace> I believe the reference is the base thread. [22:16:49] <CaptHindsight> so is 50000 x the base thread for the fast period? [22:21:03] <kwallace> It has been a while since I studied thread timing. I use the edge component for the pulse length and it uses nanosecond units. I use a UI entry of 1, then multiply by 1,000,000 to get the input value for 1 millisecond. [22:26:57] <CaptHindsight> kwallace: do you want to inject into the port or directly into the cylinder? [22:28:40] <kwallace> The plan is to put the injector into a throttle body on the existing manifold feeding two cylinders. [22:33:20] <kwallace> I have some injectors from a Mazda I had many years ago, but I assumed the fuel pump was high pressure. For small engines the fuel system really needs to be dirt cheap and simple. [22:36:14] <kwallace> Another option is to drip fuel in with a peristaltic pump, but I'm thinking the pump tube might not last very long. [22:40:22] <kwallace> I have a Honda Hurricane that I made some throttle bodies for years ago. I think I have some injectors from RC Eng. sitting on the shelf somewhere. Another unfinished project. [22:45:14] <kwallace> All I can find are circuits that hook them up directly without any support or protection. [22:46:51] <kwallace> Seems too good to be true. But wait ... there's more. 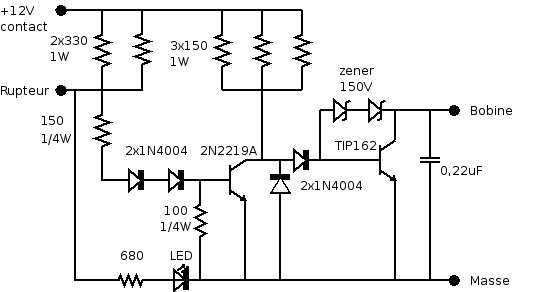 [22:48:12] <kwallace> I'm used to adding a condensor and zeners for over voltage protection. [22:54:28] <kwallace> I guess I'll find out soon, maybe tomorrow. [23:51:12] <kwallace2> dgarr: Thank you, I'll look into it. ... Oh, did you just add that feature? Double thank you. [23:52:21] <kwallace2> Well, thanks any way.